C-Line's exclusive Do-It-Yourself Laminating Film lets you seal and protect your valuable or frequently handled documents with ease. Just peel off the split back liner and apply, it's truly that easy! The super heavyweight cleer adhere luggage tag is easy to use and an inexpensive way to identify your luggage. 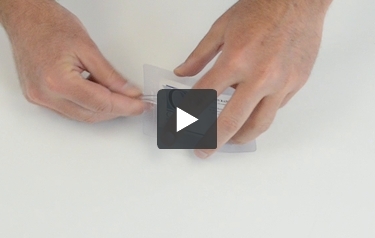 Simply position the material, peel back protective liner and seal, it's as easy as 1, 2, and 3! Cleer Adheer is the choice for quick and easy laminating protection. Multiple sizes and formats meet your individual project's needs. Insert Size: 4-1/16 x 2-13/16"
This is an excellent way to label luggage. We insert a photo business card and can easily locate our luggage at baggage claim. We needed this product for a company project we worked on. The tags worked very fine and were easy to use. I would highly recommend this product to anyone! I use the product to tag all of my band equipment cases. This helps others who help setting up sound and other equipment. It is also used for my drum set bags for the same reason. I make up tags with name and phone number for each band member to tag their instrument cases. It helps if something is left behind at a locationed we have played. I have been using the c-line for several years and plan to continue. Are the luggage loops included in this kit? Yes this kit includes 10 pouches and ten loops so that you can attach the tags to your luggage, briefcase or other items that need to be labeled.